My birth place is in Dhading, a semi-remote district, located in the central region of Nepal. It is around 90 km northwest of Kathmandu, an area of many castes and cultures and an environment ranging from sub-tropical forests and farmland to high Himalayan peaks of the Ganesh Himal Range. As a social worker, a democratic leader and a businessman, actively involved in tourism, my many activities keep me busy in many directions. In the process of my work, I meet many destitute and underprivileged people with tremendous challenges in their lives. I have never forgotten my own farm roots in the beautiful middle hills of Nepal. Thankfully, my professional work gives me the opportunityto build networks and bridges between disadvantaged people in Nepal and the international community. Many years ago, while I was employed as a teacher in a secondary school in Dhading District, I decided to pursue the Master Degree in politics. I moved to Kathmandu and my life began to change. My eyes were opened as I adjusted to life in the city and I became aware of the huge gulf between urban and rural lifestyles and opportunities. My role shifted again to that of a "policy maker" when I was elected as Dhading District's representative to the Nepali Congress Party. About the same time I became involved in the tourism industry. During my five year tenure in District politics, I have been deeply involved in various development projects including education, road construction, water supplies, agriculture and the promotion of equal rights for woman and lower caste groups. That experience has forged my present and future passion in social issues. In the mid-90s, the political situation began to change from an infant democracy to focusing more and more on the monarchy. Dissension and unrest in the political ranks strengthened the Maoist political movement and a rebel army was formed in protest of social inequities and the rule of the king. The quality of people's lives deteriorated dramatically. Especially in rural areas economic progress slowed almost to a standstill. The needs of the people were ignored and this gave fuel to the violence of the rebel movement. Recognizing the increased urgency and escalating needs of the people in our area, I have tried to refocus my priorities from the political arena to the social sector with a renewed commitment to assist the growing number of marginalized people in Dhading District, suffering without fault of their own. 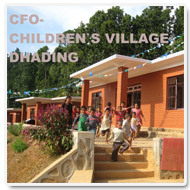 With this objective in mind, Children's Future Organization was established in 2003 to provide support to marginalized and disadvantaged children. Six years later I am happy to say that we have achieved more than we dared to imagine possible due to the enthusiastic devotion of our staff and international donors and volunteers. In the meantime, in April 2006, the united voice of the people of Nepal was heard. After a 19-day continuous, and mostly peaceful rally in the streets of Kathmandu against the monarchy, people were successful in achieving their democratic rights. Ongoing negotiations between mainstream political parties and Maoist leaders have brought about many positive changes in a short few months. The monarchical system has ended and it is time to formulate a new constitution. The prospect of a permanent peaceful solution for our people is on the horizon. The door for international cooperation is now open and the political environment achieves more stability. There are still many things we need to do such as building CFO's own Children Home, expanding its branches in other districts etc. As always, we have faith that these goals will be achieved. The need for financial and professional help from the international society to carry on this work is constantly there. In this website, we will try to share with you stories of what has been accomplished and what remains to be done. We welcome and invite your participation in any or all of these projects. We hope you will join us and let us share the joy that comes through bringing a little "sunshine" into the lives of those less fortunate than ourselves. No matter how little we have, it seems that we do not have to look far before finding someone with even less. I remember the story of the man who was complaining that he had no shoes...until he looked around and saw a man who had no feet, a humbling reminder for each of us.